The holidays may be over, but you’ve still got family enjoying an extended vacation in your home. Hopefully, they are sleeping soundly in your guest room. Quality guest mattresses are an important consideration when outfitting your household, yet frequently get overlooked. Used sporadically and for short periods of time, neglected or old guest room beds can leave friends, relatives and loved ones wishing they’d booked a room at a nearby hotel. Fortunately, you don’t have to spend a fortune when shopping for a decent guest room mattress that’s comfortable for most sleep styles. But before you start searching for a bargain bed online, remember that spare bedrooms aren’t exclusively for guests. If your partner has the flu or can’t stop snoring, wouldn’t it be wonderful to escape into your own, private room for some much-needed zzzz’s? If the answer is yes, choose a mattress that you’d be happy to snooze on when the situation arises. Going “super cheap” on a guest bed is never recommended. In the context of quality and durability, you get what you pay for. Even if it’s only used one weekend a month, a good sleep set up can generally be found for under $700, and even less during mattress close-out sales. Size considerations – If your spare room has enough space, we recommend a queen size mattress set which measures 60 inches by 80 inches. We promise your guests will thank you for the added wiggle room! By comparison a full bed offers just 54 by 75 inches of sleeping space, which can get a bit cramped between two adults. Comfort scale – While grandma loves a soft mattress, Uncle Joe may need more support for his lower back. So how do you please both? Your aim is to get a mattress that accommodates all sleep styles and comfort preferences, whether they are side sleepers, stomach sleepers or slumber on their backs. Along these lines, you can look for a mattress that is rated Plush or medium Plush. Buffeted by added padding layers, these models relieve pressure points along the hips and shoulder and offer the perfect blend of firm support and downy comfort. To Pillow top or not? – Want to treat your guests to an added touch of luxury? 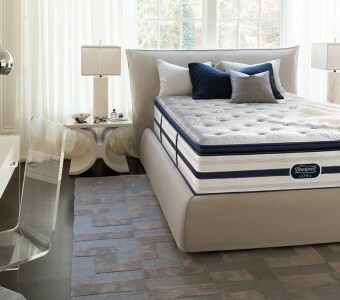 Pillow top beds like the collection from Simmons BeautyRest and Sealy Posturpedic are akin to sleeping on a cloud. Most commonly found on innerspring coil beds, pillow tops or similar cushioned bed-toppers are also available on latex, memory foam and hybrid mattresses. An inviting and comfortable mattress goes a long way for visiting guests. Show your warmth and hospitality by choosing the best mattress for your guest room that fits within your budget. Right now, Mattress World Northwest is offering pillow top queen sets by Sealy for under $500, as well as major savings on other top brands. Take advantage of our https://www.mattressworldnorthwest.com/mattress-deals/ and get select floor models at a whopping 30 percent off! Swing by one of our Portland-area outlets soon for assistance from our friendly Sleep Specialists. We’re open daily from 10 AM to 7PM.